Have you submitted an entry to the McCallum Medal competition yet? If you’re a student or young lawyer and you meet the requirements for entry, you should hurry and enter a synopsis on an employment law topic now! 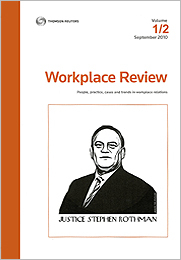 publication of your article/synopsis in our Workplace Review journal. Hurry and get your entry in now! There are also prizes for the runners-up and finalists. See the McCallum Medal 2011 Flyer and the McCallum Medal 2011 Rules for more information.